A few months ago, my 17-year-old son got in his car with his best buddy and set out on an adventure out of town. They got in trouble with the law and stayed out past bedtime on a school night. We were livid, so we put our foot down. 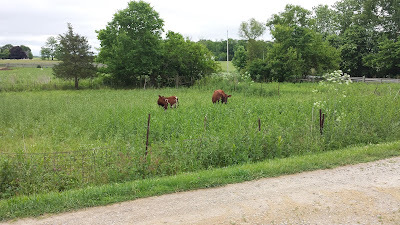 We told him that the next time he drives his 79-year-old GrandDad to a pig auction, he should follow the speed limit—and that they may have to leave before the auction is over to get home on time. 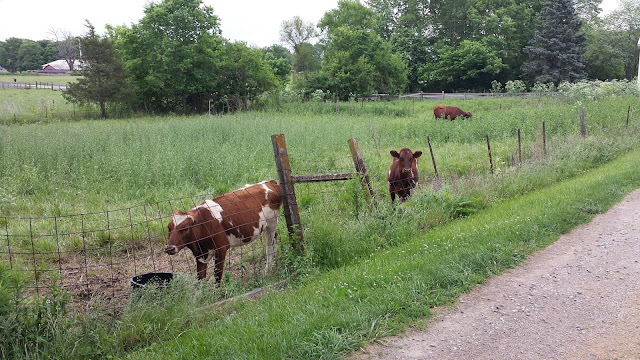 Yeah, this is the kind of wholesome trouble that my farm kids get themselves into. So our son got his first speeding ticket WAAAAY out of town and since he is a minor you can’t just pay the ticket. No, you must appear in juvenile court. With your parent. 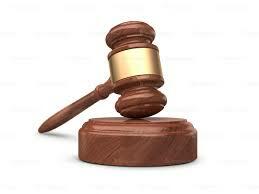 Fortunately, after waiting for weeks to determine his fate, the court date was transferred to our county. We were getting our day in court. Because we are but simple country folk and also possibly because I greatly overreacted, we over-did the whole court thing. Even though I have worked right outside the big city for years during my career, I was still gravely concerned that there would be nowhere to park. So we arrived more than an hour early. The very kindly man working security at the then-vacant juvenile court building was VERY surprised to see us so early, which was evident by the way he whipped his head around to look at the clock when we walked in. But thank goodness for his help. There were no signs, no instructions on what to do when you got there. Somehow you were supposed to know that you had to go downstairs to a little window marked Traffic to check in but then back upstairs to wait for court. As other people started arriving, it was also clear that we were overdressed. I had made our son wear his homecoming dance outfit and his father even had to dust off his pair of khakis. The OFFICIAL COURT LETTER we had received said no phones. So we sat there. For more than an hour. With no phones. Watching everyone else look at their phones. In our Sunday best. 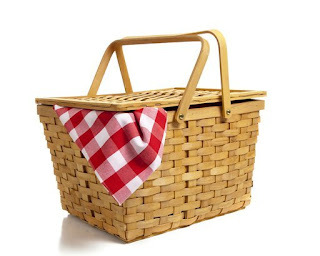 The only thing we forgot was a picnic basket containing a glass jar of hard boiled eggs. Court itself was fascinating. We all went into the court at once and they called up the kids and parents alphabetically. So we all got to hear their traffic crimes and what the magistrate had to say. Husband enjoyed this part so much, he was really disappointed when we got called up, Ryan plead guilty, the magistrate assigned our fees and they sent us back downstairs to pay. I may not have mentioned but this whole court thing happened in the evening—to keep kids from missing school. So we were hungry for dinner by the time this whole thing was over. And since I had NOT packed a picnic basket like a good country woman, we decided to go out to eat. So that’s the story of how we ended up taking our delinquent son to Spaghetti Warehouse to celebrate his traffic delinquency. Just a good old boy. Never meaning no harm. Someday the mountain might get em, but the law will-probably-catch-you-speeding-on-the-way-to-a-pig-auction. YEE-HAW! This week I went to The Little Clinic for a urinary tract infection. WOAH! I haven't blogged for years and then my first sentence back is about my down there infection. Yes. Yes, it is. If you aren't familiar, The Little Clinic is a small clinic inside a Kroger grocery store. They have a nurse practitioner on hand who can diagnose and treat basic ailments like ear infections, strep throat and apparently, down there infections. 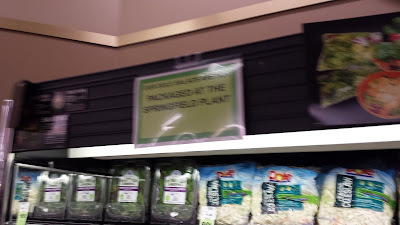 I had plenty of time to read their rotating sign of services and I was surprised to see they were taking on some things that seemed way beyond the scope of what you would want to medically deal with inside of a grocery store. 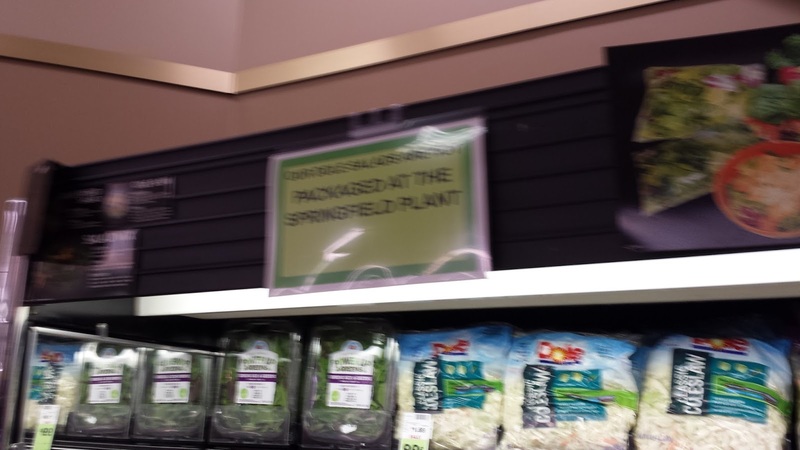 Apparently, after just 20 minutes with a nurse practitioner next to the frozen food, you too can be treated for depression, osteoporosis, smoking cessation and Japanese Encephalitis, an actual vaccine you can get inside the grocery, in Ohio. The Little Clinic has a VERY small waiting area, so many patients were spilling out to the grocery aisle to sniffle and groan. They also did not have their own bathroom. So the lady with the down there infection had to walk past the frozen food, past the deli and back to the waiting area with her cup of urine discreetly inside a paper sack. And when you are having all the fun of capturing lady urine in a grocery store bathroom, it does NOT HELP when your 44-year-old bladder suddenly becomes shy. Seriously, does any 44-year-old woman ever have to worry about trouble making urine. Making pee is a 44-year-old woman's super power. Take us on a car trip or make us laugh really hard, you'll see. So. my tablespoon of pee collected and stored discreetly inside the paper sack, I had time to read the rotating sig... OMG DID THAT JUST SAY RABIES? Are there people inside the grocery store right now with RABIES waiting to be seen? Good thing I had already peed ALL my pee. It is true. I am not making this up. You can get treated for rabies in the grocery store. See it here on their list of services. I am trying to imagine the thought process of a person who has just been bitten by an opossum who decides, well this Little Clinic office website only shows a 15 minute wait, so that seems good for rabies. So they start driving to the Kroger and checking, yep 15 minutes, OK 16 minutes, yeah 14 minutes and then gets to the kiosk and refreshes only to see WAIT TIME: 1 HOUR AND YOU DIED OF RABIES. And here we thought all the rabid people were at Wal-Mart. Every two years the nationally renowned Erma Bombeck Writers' Workshop is held here in Dayton. The event typically sells out in hours, but one way to gain entry is to enter the Erma Bombeck Writing Competition--there is even a category for local writers. Several of my local friends who are great bloggers and hilarious Facebook commenters have been talking smack about winning this thing since we were all shut out two years ago by booger stories. Nancy Cartwright, Dayton native and the the voice of Bart Simpson, judged the finalists this year. Apparently, she did not like my entry. Recently, famous blogger and author Jenny Lawson shared an article she had written that was rejected by Oprah's magazine. So, inspired by her, I will share my article that I'm sure made it all the way to Nancy [it did not] and then was rejected for not being about boogers or port-a-johns. Check out "All the Dreeds of Pigs" in a future post on this blog. I REALLY hate going to the grocery. I have documented it well. So I am going to start something (that I will probably abandon later) called Dear Grocery Store. Here are some craptastic fairly OK photos I took at your store. 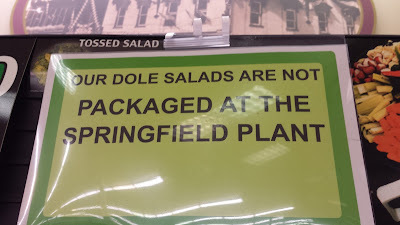 I appreciate that you are trying to let us know that the lettuce you sell is listeria-free and not from the Springfield Dole plant. BUT you may have wanted to put "Our Dole salads are not" in the larger text. 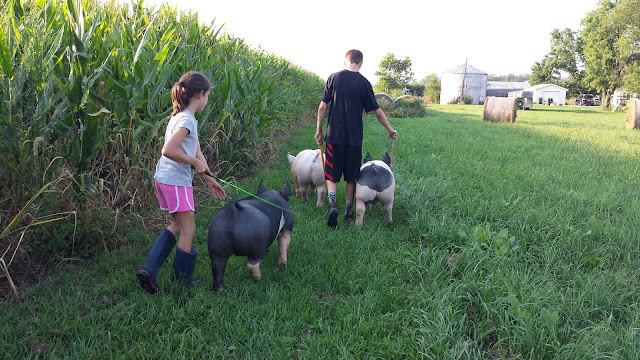 Getting the pigs ready for our county fair includes nightly walks in the pasture. Starting off summer with Ayrshire dairy females grazing in the lot by our driveway. 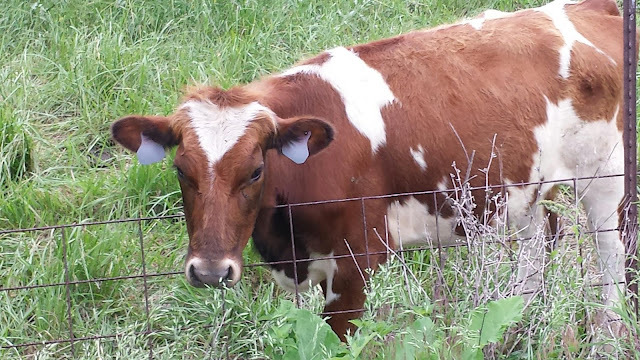 Our family used to milk Ayrshires but we now just keep a few on hand for 4-H projects.